Not to be confused with Foreign Service Institute. The Edmund A. Walsh School of Foreign Service, known simply as the School of Foreign Service or SFS, is a school of international relations at Georgetown University in Washington, D.C. It is considered to be one of the world's leading international affairs schools, granting degrees at both undergraduate and graduate levels. The school's most notable alumni include U.S. President Bill Clinton, former CIA Director George Tenet, and King Felipe VI of Spain, as well as the heads of state or government of many countries. Its faculty has also included many distinguished figures in international affairs, such as the former U.S. Secretary of State Madeleine Albright, former U.S. Defense Secretary Chuck Hagel, and the former President of Poland Aleksander Kwaśniewski. Logo of the Walsh School of Foreign Service at Georgetown University. Founded in 1919, the School of Foreign Service predates the U.S. Foreign Service by six years, and is sometimes referred to as the “West Point of the U.S. diplomatic corps” due to the large number of graduates who end up shaping U.S. foreign policy. Despite its reputation for producing prominent American statesmen and diplomats, SFS is not a diplomatic academy and its graduates go on to have careers in a diverse set of sectors, including Wall Street. The School of Foreign Service was established by Edmund A. Walsh with the goal of preparing Americans for various international professions in the wake of expanding U.S. involvement in world affairs after the First World War. Today, the school hosts a student body of approximately 2,250 from over 100 nations each year. It offers an undergraduate program based in the liberal arts, which leads to the Bachelor of Science in Foreign Service degree, as well as eight interdisciplinary graduate programs. The school has evolved from its original emphasis on diplomacy and law to become a center for research and teaching on global affairs. Faculty are today drawn from disciplines such as political science, history, economics and cultural studies, as well as from business, the non-profit sector and international organizations. The school has about 1,400 undergraduates seeking a Bachelor of Science in Foreign Service (B.S.F.S.) degree. The undergraduate program is intended to provide a liberal arts education with a focus in international affairs. Undergraduates concentrate in International Politics (IPOL), International History (IHIS), Culture and Politics (CULP), International Economics (IECO), International Political Economy (IPEC), Regional and Comparative Studies (RCST), Global Business (GBUS), or Science, Technology, & International Affairs (STIA). The STIA program was the first of its kind. Harvard and Georgia Tech, among others, now have STIA programs as well. Graduate students can pursue eight graduate programs: five regional studies programs as well as the Master of Science in Foreign Service (MSFS), Master of Global Human Development and the Master of Arts in Security Studies Program. Graduates go on to careers in the public, private, and nonprofit sectors as well as further higher education. Alumni include current (Jordan, Lithuania, Spain, and Bosnia), and recent (United States, Philippines) heads of state. The current dean of the school is Joel Hellman. Notable faculty members at the Walsh School of Foreign Service have included former US Secretary of State Madeleine Albright, former Undersecretary of Defense Douglas Feith, former Polish President Aleksander Kwaśniewski, former National Security Advisor Anthony Lake, former U.S. Senator and Obama Secretary of Defense Chuck Hagel, Ambassador Donald McHenry, former CIA Director George Tenet, former Malaysian Deputy Prime Minister and current Malaysian Opposition Leader Anwar Ibrahim, former World Bank VP Callisto Madavo, former Dean Robert Gallucci, former USAID Administrator and Special Envoy for Sudan Andrew Natsios, Ambassador of Israel to the United States Michael Oren, former Prime Minister of Spain José María Aznar, and former President of Colombia Alvaro Uribe Velez. The School of Foreign Service's undergraduate program features a rigorous core curriculum including a freshman proseminar, two philosophy courses, two theology courses, two humanities and writing courses, two government courses, two courses in engaging diversity, three history courses (including two non-Western regional history courses), a four-course economics sequence, and a geopolitics course unique to SFS entitled Map of the Modern World. To graduate, students must also attain proficiency in at least one modern foreign language, demonstrated through successful completion of a specially-designed oral exam (and other requirements as determined by the department). In addition to their major, students may choose from a number of undergraduate certificate programs: African Studies, Arab Studies, Asian Studies, Australian & New Zealand Studies, German and European Studies, International Business Diplomacy, International Development, Muslim-Christian Understanding, Jewish Civilization, Justice & Peace Studies, Latin American Studies, Medieval Studies, Russian & East European Studies, Social & Political Thought, and Women's and Gender Studies. There are also two joint degrees offered in partnership with Georgetown's McDonough School of Business. The first is the Global Executive MBA, which is offered in collaboration with the ESADE Business School in Spain. and the INCAE Business School in Costa Rica. The second is the MA in International Business and Policy. In addition, the Institute for the Study of Diplomacy holds the Georgetown Leadership Seminar for an annual gathering of selected rising leaders from around the world for a week of intensive discussion on major international issues. Georgetown's programs in international relations have consistently ranked among the best in the world in surveys of the field's academics that have been published biennially since 2005 by Foreign Policy magazine. In 2014,and again in 2018, Foreign Policy ranked Georgetown's master's programs first in the world and its bachelor's programs fourth. In a separate survey of makers of American foreign-policy from 2011, Georgetown ranked second overall, after Harvard, in the quality of preparation for a career in the U.S. government, regardless of degree earned. The School of Foreign Service main campus is located in northwest Washington, D.C.. It opened another campus, which is known as SFS-Q, in Doha's Education City, in the Emirate of Qatar in 2005. Nearly all SFS undergraduates spend a minimum of one semester or a summer abroad, choosing from direct matriculation programs around the globe as well as programs of other universities and those run by Georgetown. Georgetown University's undergraduate schools and medical campus are located together on Main Campus, which sits on the "Hilltop", an elevated site in the heart of Washington above the Potomac River. The campus' main gates are located at the intersection of 37th and O Streets, NW. Georgetown University Medical Center is on the northern side of campus, best accessed through the multiple entrances on Reservoir Road between 37th and 39th Sts, NW. In 2002, the Qatar Foundation for Education, Science and Community Development presented the School of Foreign Service with the resources and space to open a facility in the new Education City in Doha, Qatar. SFS-Qatar opened in 2005; as of 2016, SFS-Q had a total student body of 252, with an undergraduate population of 64. The first graduating class of SFS-Q, all of whom have BSFS degrees with a major of International Politics, received their diplomas in May 2009. Ahmad S. Dallal serves as the current Dean for the SFS-Q Campus. 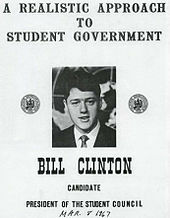 Bill Clinton, class of 1968, ran for student council president his senior year. Steve Bannon (1983), White House Chief Strategist Counselor to the President, Trump administration. ^ a b c d e "Georgetown Key Facts". Georgetown University. ^ "Walsh School of Foreign Service, Faculty List". Archived from the original on 2007-10-21. Retrieved 2008-02-25. ^ "Culture and Politics Major - School of Foreign Service - Georgetown University". 1 November 2015. ^ "International Politics Major - School of Foreign Service - Georgetown University". 27 October 2015. ^ "Science, Technology and International Affairs Major - School of Foreign Service - Georgetown University". 24 October 2015. ^ "The Best International Relations Schools in the World" – via Foreign Policy. ^ "Pipeline to the Beltway?" – via Foreign Policy. ^ Heberle, Robert (May 20, 2005). "SFS to Establish Qatar Campus". The Hoya. Archived from the original on November 4, 2005. Retrieved 2007-08-04. ^ "Georgetown University in Qatar Annual Report 2016-17". Retrieved 2017-12-14. ^ "Goei, Dexter". Reuters. Retrieved 21 May 2015. ^ "Prominent Alumni – School of Foreign Service". sfs.georgetown.edu. Retrieved 2016-05-02.